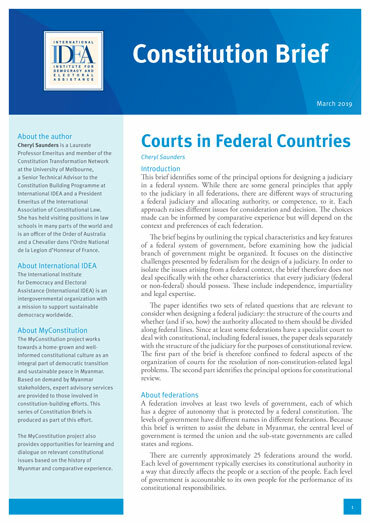 While there are general principles that apply to the judiciary in all federations, there are different ways of structuring a federal judiciary and allocating authority, or competence, to it. Each approach raises different issues for consideration and decision. The choices made can be informed by comparative experience but will depend on the context and preferences of each federation. The brief begins by outlining the typical characteristics and key features of a federal system of government, before examining how the judicial branch of government might be organized. It identifies two sets of related questions that are relevant to consider when designing a federal judiciary: the structure of the courts and whether (and if so, how) the authority allocated to them should be divided along federal lines.